Zoroastrianism,[n 1] or Mazdayasna, is one of the world's oldest religions that remains active. It is a monotheistic faith (i.e. a single creator God), centered in a dualistic cosmology of good and evil and an eschatology predicting the ultimate destruction of evil. Ascribed to the teachings of the Iranian-speaking prophet Zoroaster (also known as Zarathustra), it exalts a deity of wisdom, Ahura Mazda (Wise Lord), as its Supreme Being. Major features of Zoroastrianism, such as messianism, judgment after death, heaven and hell, and free will may have influenced other religious systems, including Second Temple Judaism, Gnosticism, Christianity, Islam, and Buddhism. The most important texts of the religion are those of the Avesta, which includes the writings of Zoroaster known as the Gathas, enigmatic poems that define the religion's precepts, and the Yasna, the scripture. The full name by which Zoroaster addressed the deity is: Ahura, The Lord Creator, and Mazda, Supremely Wise. The religious philosophy of Zoroaster divided the early Iranian gods of Proto-Indo-Iranian tradition, but focused on responsibility, and did not create a devil per se. Zoroaster proclaimed that there is only one God, the singularly creative and sustaining force of the Universe, and that human beings are given a right of choice. Because of cause and effect, they are responsible for the consequences of their choices. The contesting force to Ahura Mazda was called Angra Mainyu, or angry spirit. Post-Zoroastrian scripture introduced the concept of Ahriman, the Devil, which was effectively a personification of Angra Mainyu. Zoroastrianism's creator Ahura Mazda, through the Spenta Mainyu (Good Spirit, "Bounteous Immortals") is an all-good "father" of Asha (Truth, "order, justice"), in opposition to Druj ("falsehood, deceit") and no evil originates from "him". "He" and his works are evident to humanity through the six primary Amesha Spentas and the host of other Yazatas, through whom worship of Mazda is ultimately directed. Spenta Mainyu adjoined unto "truth", oppose the Spirit's opposite, Angra Mainyu and its forces born of Akəm Manah ("evil thinking"). The name Zoroaster is a Greek rendering of the name Zarathustra. He is known as Zartosht and Zardosht in Persian and Zaratosht in Gujarati. The Zoroastrian name of the religion is Mazdayasna, which combines Mazda- with the Avestan language word yasna, meaning "worship, devotion". In English, an adherent of the faith is commonly called a Zoroastrian or a Zarathustrian. An older expression still used today is Behdin, meaning "The best Religion | Beh < Middle Persian Weh (good) + Din < Middle Persian dēn < Avestan Daēnā". In Zoroastrian liturgy the term is used as a title for an individual who has been formally inducted into the religion in a Navjote ceremony. The term Mazdaism (/ˈmæzdə.ɪzəm/) is a typical 19th century construct, taking Mazda- from the name Ahura Mazda and adding the suffix -ism to suggest a belief system. The March 2001 draft edition of the Oxford English Dictionary also records an alternate form, Mazdeism, perhaps derived from the French Mazdéisme, which first appeared in 1871. Zoroastrian philosophy is identified as having been known to Italian Renaissance Europe through an image of Zoroaster in Raphael's "School of Athens" by Giorgio Vasari in 1550. The first surviving reference to Zoroaster in English scholarship is attributed to Thomas Browne (1605–1682), who briefly refers to the prophet in his 1643 Religio Medici, followed by the Oxford English Dictionary's record of the 1743 (Warburton, Pope's Essay). The Oxford English Dictionary records use of the term Zoroastrianism in 1874 in Archibald Sayce's Principles of Comparative Philology. Zoroastrians believe that there is one universal, transcendent, supreme God, Ahura Mazda, or the "Wise Lord". (Ahura means "Being" and Mazda means "Mind" in a sacred Old Iranian language called Avestan). Zoroaster keeps the two attributes separate as two different concepts in most of the Gathas and also consciously uses a masculine word for one concept and a feminine for the other, as if to distract from an anthropomorphism of his divinity. Zoroaster claimed that Ahura Mazda is almighty, though not omnipotent. Other scholars assert that since Zoroastrianism's divinity covers both being and mind as immanent entities, it is better described as a belief in an immanent self-creating universe with consciousness as its special attribute, thereby putting Zoroastrianism in the pantheistic fold where it can be easily traced to its shared origin with Indian Brahmanism. In any case, Ahura Mazda's creation—evident is widely agreed as asha, truth and order—is the antithesis of chaos, which is evident as druj, falsehood and disorder. The resulting conflict involves the entire universe, including humanity, which has an active role to play in the conflict. 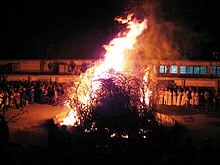 In Zoroastrian tradition, the "chaotic" is represented by Angra Mainyu (also referred to as "Ahriman"), the "Destructive Principle", while the benevolent is represented through Ahura Mazda's Spenta Mainyu, the instrument or "Bounteous Principle" of the act of creation. It is through Spenta Mainyu that transcendental Ahura Mazda is immanent in humankind, and through which the Creator interacts with the world. According to Zoroastrian cosmology, in articulating the Ahuna Vairya formula, Ahura Mazda made His ultimate triumph evident to Angra Mainyu. As expressions and aspects of Creation, Ahura Mazda emanated the Amesha Spentas ("Bounteous Immortals"), that are each the hypostasis and representative of one aspect of that Creation. These Amesha Spenta are in turn assisted by a league of lesser principles, the Yazatas, each "Worthy of Worship" and each again a hypostasis of a moral or physical aspect of creation. Zoroastrian theology includes a duty to protect nature. This has led some to proclaim it as the "world's first ecological religion." Some have argued that, since the protections are part of a ritual, they stem from theology rather than ecology. Others have responded that, since as one of its strongest precepts the scripture calls for the protection of water, earth, fire and air it is, in effect, an ecological religion: "It is not surprising that Mazdaism ... is called the first ecological religion. The reverence for Yazatas (divine spirits) emphasizes the preservation of nature (Avesta: Yasnas 1.19, 3.4, 16.9; Yashts 6.3–4, 10.13)." However, this particular assertion is undermined in that Zoroastrians have a duty to exterminate "evil" species. The religion states that active participation in life through good deeds is necessary to ensure happiness and to keep chaos at bay. This active participation is a central element in Zoroaster's concept of free will, and Zoroastrianism rejects all forms of monasticism. Ahura Mazda will ultimately prevail over the evil Angra Mainyu or Ahriman, at which point the universe will undergo a cosmic renovation and time will end. In the final renovation, all of creation—even the souls of the dead that were initially banished to "darkness"—will be reunited in Ahura Mazda, returning to life in the undead form. At the end of time, a savior-figure (a Saoshyant) will bring about a final renovation of the world (frashokereti), in which the dead will be revived. In Zoroastrian tradition, life is a temporary state in which a mortal is expected to actively participate in the continuing battle between truth and falsehood. Prior to being born, the urvan (soul) of an individual is still united with its fravashi (guardian spirit), which has existed since Mazda created the universe. During life, the fravashi acts as a guardian and protector. On the fourth day after death, the soul is reunited with its fravashi, in which the experiences of life in the material world are collected for the continuing battle in the spiritual world. For the most part, Zoroastrianism does not have a notion of reincarnation, at least not until the final renovation of the world. Followers of Ilm-e-Kshnoom in India believe in reincarnation and practice vegetarianism, two principles unknown to Orthodox Zoroastrianism, although Zoroaster was himself a vegetarian. In Zoroastrianism, water (apo, aban) and fire (atar, azar) are agents of ritual purity, and the associated purification ceremonies are considered the basis of ritual life. 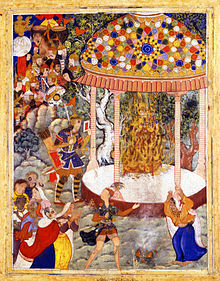 In Zoroastrian cosmogony, water and fire are respectively the second and last primordial elements to have been created, and scripture considers fire to have its origin in the waters. Both water and fire are considered life-sustaining, and both water and fire are represented within the precinct of a fire temple. Zoroastrians usually pray in the presence of some form of fire (which can be considered evident in any source of light), and the culminating rite of the principal act of worship constitutes a "strengthening of the waters". Fire is considered a medium through which spiritual insight and wisdom are gained, and water is considered the source of that wisdom. A corpse is considered a host for decay, i.e., of druj. Consequently, scripture enjoins the safe disposal of the dead in a manner such that a corpse does not pollute the good creation. These injunctions are the doctrinal basis of the fast-fading traditional practice of ritual exposure, most commonly identified with the so-called Towers of Silence for which there is no standard technical term in either scripture or tradition. Ritual exposure is only practiced by Zoroastrian communities of the Indian subcontinent, in locations where it is not illegal and diclofenac poisoning has not led to the virtual extinction of scavenger birds. Other Zoroastrian communities either cremate their dead, or bury them in graves that are cased with lime mortar. While the Parsees in India have traditionally been opposed to proselytizing, and even considered it a crime for which the culprit may face expulsion, Iranian Zoroastrians have never been opposed to conversion, and the practice has been endorsed by the Council of Mobeds of Tehran. While the Iranian authorities do not permit proselytizing within Iran, Iranian Zoroastrians in exile have actively encouraged missionary activities, with The Zarathushtrian Assembly in Los Angeles and the International Zoroastrian Centre in Paris as two prominent centres. As in many other faiths, Zoroastrians are encouraged to marry others of the same faith, but this is not a requirement. The roots of Zoroastrianism are thought to have emerged from a common prehistoric Indo-Iranian religious system dating back to the early 2nd millennium BCE. The prophet Zoroaster himself, though traditionally dated to the 6th century BCE, is thought by many modern historians to have been a reformer of the polytheistic Iranian religion who lived in the 10th century BCE. Zoroastrianism as a religion was not firmly established until several centuries later. Zoroastrianism enters recorded history in the mid-5th century BCE. Herodotus' The Histories (completed c. 440 BCE) includes a description of Greater Iranian society with what may be recognizably Zoroastrian features, including exposure of the dead. The Histories is a primary source of information on the early period of the Achaemenid era (648–330 BCE), in particular with respect to the role of the Magi. According to Herodotus i.101, the Magi were the sixth tribe of the Medes (until the unification of the Persian empire under Cyrus the Great, all Iranians were referred to as "Mede" or "Mada" by the peoples of the Ancient World), who appear to have been the priestly caste of the Mesopotamian-influenced branch of Zoroastrianism today known as Zurvanism, and who wielded considerable influence at the courts of the Median emperors. The Zoroastrian Achaemenid Empire at its greatest extent. Following the unification of the Median and Persian empires in 550 BCE, Cyrus the Great and, later, his son Cambyses II curtailed the powers of the Magi after they had attempted to sow dissent following their loss of influence. In 522 BCE, the Magi revolted and set up a rival claimant to the throne. The usurper, pretending to be Cyrus' younger son Smerdis, took power shortly thereafter. Owing to the despotic rule of Cambyses and his long absence in Egypt, "the whole people, Persians, Medes and all the other nations" acknowledged the usurper, especially as he granted a remission of taxes for three years (Herodotus iii. 68). Darius I and later Achaemenid emperors acknowledged their devotion to Ahura Mazda in inscriptions, as attested to several times in the Behistun inscription, and appear to have continued the model of coexistence with other religions. Whether Darius was a follower of Zoroaster has not been conclusively established, since devotion to Ahura Mazda was (at the time) not necessarily an indication of an adherence to Zoroaster's teaching. A number of the Zoroastrian texts that today are part of the greater compendium of the Avesta have been attributed to that period. This calendar attributed to the Achaemenid period is still in use today. Additionally, the divinities, or yazatas, are present-day Zoroastrian angels (Dhalla, 1938). According to later Zoroastrian legend (Denkard and the Book of Arda Viraf), many sacred texts were lost when Alexander the Great's troops invaded Persepolis and subsequently destroyed the royal library there. Diodorus Siculus's Bibliotheca historica, which was completed circa 60 BCE, appears to substantiate this Zoroastrian legend (Diod. 17.72.2–17.72.6). According to one archaeological examination, the ruins of the palace of Xerxes bear traces of having been burned (Stolze, 1882). Whether a vast collection of (semi-)religious texts "written on parchment in gold ink", as suggested by the Denkard, actually existed remains a matter of speculation, but is unlikely. Given that many of the Denkards statements-as-fact have since been refuted by scholars, the tale of the library is widely accepted to be fictional (Kellens, 2002). Alexander's conquests largely displaced Zoroastrianism with Hellenistic beliefs, though the religion continued to be practiced many centuries following the demise of the Achaemenids in mainland Persia and the core regions of the former Achaemenid Empire, most notably Anatolia, Mesopotamia, and the Caucasus. In the Cappadocian kingdom, whose territory was formerly an Achaemenid possession, Persian colonists, cut off from their co-religionists in Iran proper, continued to practice the faith [Zoroastrianism] of their forefathers; and there Strabo, observing in the first century B.C., records (XV.3.15) that these "fire kindlers" possessed many "holy places of the Persian Gods", as well as fire temples. Strabo furthermore relates, were "noteworthy enclosures; and in their midst there is an altar, on which there is a large quantity of ashes and where the magi keep the fire ever burning." It was not until the end of the Parthian period (247 b.c.–a.d. 224) that Zoroastrianism would receive renewed interest. As late as the Parthian period, a form of Zoroastrianism was without a doubt the dominant religion in the Armenian lands. The Sassanids aggressively promoted the Zurvanite form of Zoroastrianism, often building fire temples in captured territories to promote the religion. During the period of their centuries long suzerainty over the Caucasus, the Sassanids made attempts to promote Zoroastrianism there with considerable successes, and it was prominent in the pre-Christian Caucasus (especially modern-day Azerbaijan). Due to its ties to the Christian Roman Empire, Persia's arch-rival since Parthian times, the Sassanids were suspicious of Roman Christianity, and, after the reign of Constantine the Great, sometimes persecuted it. The Sassanid authority clashed with their Armenian subjects in the Battle of Avarayr (a.d. 451), making them officially break with the Roman Church. But the Sassanids tolerated or even sometimes favored the Christianity of the Church of the East. The acceptance of Christianity in Georgia (Caucasian Iberia) saw the Zoroastrian religion there slowly but surely decline, but as late the 5th century a.d. it was still widely practised as something like a second established religion. Most of the Sassanid Empire was overthrown by the Arabs over the course of 16 years in the 7th century. Although the administration of the state was rapidly Islamicized and subsumed under the Umayyad Caliphate, in the beginning "there was little serious pressure" exerted on newly subjected people to adopt Islam. Because of their sheer numbers, the conquered Zoroastrians had to be treated as dhimmis (despite doubts of the validity of this identification that persisted down the centuries), which made them eligible for protection. Islamic jurists took the stance that only Muslims could be perfectly moral, but "unbelievers might as well be left to their iniquities, so long as these did not vex their overlords." In the main, once the conquest was over and "local terms were agreed on", the Arab governors protected the local populations in exchange for tribute. 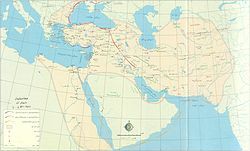 The Arabs adopted the Sassanid tax-system, both the land-tax levied on land owners and the poll-tax levied on individuals, called jizya, a tax levied on non-Muslims (i.e., the dhimmis). In time, this poll-tax came to be used as a means to humble the non-Muslims, and a number of laws and restrictions evolved to emphasize their inferior status. Under the early orthodox caliphs, as long as the non-Muslims paid their taxes and adhered to the dhimmi laws, administrators were enjoined to leave non-Muslims "in their religion and their land." (Caliph Abu Bakr, qtd. in Boyce 1979, p. 146). Under Abbasid rule, Muslim Iranians (who by then were in the majority) increasingly found ways to taunt Zoroastrians, and distressing them became a popular sport. For example, in the 9th century, a deeply venerated cypress tree in Khorasan (which Parthian-era legend supposed had been planted by Zoroaster himself) was felled for the construction of a palace in Baghdad, 2,000 miles (3,200 km) away. In the 10th century, on the day that a Tower of Silence had been completed at much trouble and expense, a Muslim official contrived to get up onto it, and to call the adhan (the Muslim call to prayer) from its walls. This was made a pretext to annex the building. Another popular means to distress Zoroastrians was to maltreat dogs, as these animals are sacred in Zoroastrianism. Such baiting, which was to continue down the centuries, was indulged in by all; not only by high officials, but by the general uneducated population as well. Though subject to a new leadership and harassment, the Zoroastrians were able to continue in their former ways. But there was a slow but steady social and economic pressure to convert. The nobility and city-dwellers were the first to convert, with Islam more slowly being accepted among the peasantry and landed gentry. "Power and worldly-advantage" now lay with followers of Islam, and although the "official policy was one of aloof contempt, there were individual Muslims eager to proselytize and ready to use all sorts of means to do so." Two decrees in particular encouraged the transition to a preponderantly Islamic society. The first edict, adapted from an Arsacid and Sassanid one (but in those to the advantage of Zoroastrians), was that only a Muslim could own Muslim slaves or indentured servants. Thus, a bonded individual owned by a Zoroastrian could automatically become a freeman by converting to Islam. The other edict was that if one male member of a Zoroastrian family converted to Islam, he instantly inherited all its property. In time, a tradition evolved by which Islam was made to appear as a partly Iranian religion. One example of this was a legend that Husayn, son of the fourth caliph Ali and grandson of Islam's prophet Muhammad, had married a captive Sassanid princess named Shahrbanu. This "wholly fictitious figure" was said to have borne Husayn a son, the historical fourth Shi'a imam, who claimed that the caliphate rightly belonged to him and his descendants, and that the Umayyads had wrongfully wrested it from him. The alleged descent from the Sassanid house counterbalanced the Arab nationalism of the Umayyads, and the Iranian national association with a Zoroastrian past was disarmed. Thus, according to scholar Mary Boyce, "it was no longer the Zoroastrians alone who stood for patriotism and loyalty to the past." The "damning indictment" that becoming Muslim was Un-Iranian only remained an idiom in Zoroastrian texts. With Iranian (especially Persian) support, the Abbasids overthrew the Umayyads in 750, and in the subsequent caliphate government—that nominally lasted until 1258—Muslim Iranians received marked favor in the new government, both in Iran and at the capital in Baghdad. This mitigated the antagonism between Arabs and Iranians, but sharpened the distinction between Muslims and non-Muslims. The Abbasids zealously persecuted heretics, and although this was directed mainly at Muslim sectarians, it also created a harsher climate for non-Muslims. Although the Abbasids were deadly foes of Zoroastrianism, the brand of Islam they propagated throughout Iran became in turn ever more "Zoroastrianized", making it easier for Iranians to embrace Islam. Despite economic and social incentives to convert, Zoroastrianism remained strong in some regions, particularly in those furthest away from the Caliphate capital at Baghdad. In Bukhara (in present-day Uzbekistan), resistance to Islam required the 9th-century Arab commander Qutaiba to convert his province four times. The first three times the citizens reverted to their old religion. Finally, the governor made their religion "difficult for them in every way", turned the local fire temple into a mosque, and encouraged the local population to attend Friday prayers by paying each attendee two dirhams. The cities where Arab governors resided were particularly vulnerable to such pressures, and in these cases the Zoroastrians were left with no choice but to either conform or migrate to regions that had a more amicable administration. The 9th century came to define the great number of Zoroastrian texts that were composed or re-written during the 8th to 10th centuries (excluding copying and lesser amendments, which continue for some time thereafter). All of these works are in the Middle Persian dialect of that period (free of Arabic words), and written in the difficult Pahlavi script (hence the adoption of the term "Pahlavi" as the name of the variant of the language, and of the genre, of those Zoroastrian books). If read aloud, these books would still have been intelligible to the laity. Many of these texts are responses to the tribulations of the time, and all of them include exhortations to stand fast in their religious beliefs. Some, such as the "Denkard", are doctrinal defenses of the religion, while others are explanations of theological aspects (such as the Bundahishn's) or practical aspects (e.g., explanation of rituals) of it. About sixty such works are known to have existed, of which some are known only from references to them in other works. In Khorasan in the northeastern Iran, a 10th-century Iranian nobleman brought together four Zoroastrian priests to transcribe a Sassanid-era Middle Persian work titled Book of the Lord (Khwaday Namag) from Pahlavi script into Arabic script. This transcription, which remained in Middle Persian prose (an Arabic version, by al-Muqaffa, also exists), was completed in 957 and subsequently became the basis for Firdausi's Book of Kings. It became enormously popular among both Zoroastrians and Muslims, and also served to propagate the Sassanid justification for overthrowing the Arsacids (i.e., that the Sassanids had restored the faith to its "orthodox" form after the Hellenistic Arsacids had allowed Zoroastrianism to become corrupt). Among migrations were those to cities in (or on the margins of) the great salt deserts, in particular to Yazd and Kerman, which remain centers of Iranian Zoroastrianism to this day. Yazd became the seat of the Iranian high priests during Mongol Il-Khanate rule, when the "best hope for survival [for a non-Muslim] was to be inconspicuous." Crucial to the present-day survival of Zoroastrianism was a migration from the northeastern Iranian town of "Sanjan in south-western Khorasan", to Gujarat, in western India. The descendants of that group are today known as the Parsis—"as the Gujaratis, from long tradition, called anyone from Iran"—who today represent the larger of the two groups of Zoroastrians. The struggle between Zoroastrianism and Islam declined in the 10th and 11th centuries. Local Iranian dynasties, "all vigorously Muslim," had emerged as largely independent vassals of the Caliphs. In the 16th century, in one of the early letters between Iranian Zoroastrians and their co-religionists in India, the priests of Yazd lamented that "no period [in human history], not even that of Alexander, had been more grievous or troublesome for the faithful than 'this millennium of the demon of Wrath'." Zoroastrianism has survived into the modern period, particularly in India, where it has been present since about the 9th century. Today Zoroastrianism can be divided in three different sects or dominions: restorationists, progressives and traditionalists (or isolationists). Traditionalists or isolationists are almost solely Parsis and accept, beside the Gathas and Avesta, also the Middle Persian works called 'Nasks of the Sassanians'. They generally do not allow conversion to the faith. Therefore, for someone to be a Zoroastrian, they must be born of Zoroastrian parents. Some traditionalists recognize the children of mixed marriages as Zoroastrians. 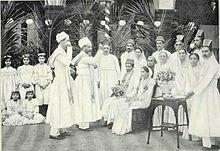 From the 19th century onward, the Parsis gained a reputation for their education and widespread influence in all aspects of society. They played an instrumental role in the economic development of the region over many decades; several of the best-known business conglomerates of India are run by Parsi-Zoroastrians, including Tata, Godrej, Wadia families, and others. Though the Armenians share a rich history affiliated with Zoroastrianism (that eventually declined with the advent of Christianity), reports indicate that there were Zoroastrian Armenians in Armenia until the 1920s. A comparatively minor population persisted in Central Asia, the Caucasus, and Persia, and an expatriate community has formed in the United States (some from India), and to a lesser extent in the United Kingdom, Canada and Australia. Many of these are titled restorationists, progressives or "reformists". Progressives generally accept the Yashts and the Visperad texts of the Avesta as obligatory, along with the Gathas. Restorationists refer only to the compositions of Zoroaster, and thus only consider the Gathas, the other texts only having value as far as they elaborate on some Gathic point and do not contradict the Gathic teaching. At the request of the government of Tajikistan, UNESCO declared 2003 a year to celebrate the "3000th anniversary of Zoroastrian culture", with special events throughout the world. In 2011 the Tehran Mobeds Anjuman announced that for the first time in the history of Iran and of the Zoroastrian communities worldwide, women had been ordained in Iran and North America as mobedyars, meaning women mobeds (Zoroastrian priests). The women hold official certificates and can perform the lower-rung religious functions and can initiate people into the religion. The Achaemenid Empire in the 5th century BCE consisted of the largest empire in history by percentage of world population. Some scholars believe that key concepts of Zoroastrian eschatology and demonology influenced the Abrahamic religions. On the other hand, Zoroastrianism itself inherited ideas from other belief systems and, like other "practiced" religions, accommodates some degree of syncretism. Zoroastrian influences on Hungarian, Slavic, Ossetian, Turkic and Mongol mythologies have also been noted, all of which bearing extensive light/dark dualisms and possible sun god theonyms related to Hvare-khshaeta. The religion of Zoroastrianism is closest to Vedic religion. Some historians believe that Zoroastrianism, along with similar philosophical revolutions in South Asia were interconnected strings of reformation against a common Indo-Aryan thread. Many traits of Zoroastrianism can be traced back to the culture and beliefs of the prehistorical Indo-Iranian period, that is, to the time before the migrations that led to the Indo-Aryans and Iranics becoming distinct peoples. Zoroastrianism consequently shares elements with the historical Vedic religion that also has its origins in that era. An example is the relation of the Avestan word Ahura ("Ahura Mazda") and the Vedic Sanskrit word Asura ("demon; evil demigod"), and Daeva ("demon") and Deva ("god"). They are descended from a common Proto-Indo-Iranian religion. Vedic religious texts are replete with people from far flung countries practising or leaving Aryan teachings. Zoroastrianism is often compared with Manichaeism. Nominally an Iranian religion, it has its origins in Middle-Eastern Gnosticism. Superficially such a comparison seems apt, as both are dualistic and Manichaeism adopted many of the Yazatas for its own pantheon. Gherardo Gnoli, in The Encyclopaedia of Religion, says that "we can assert that Manichaeism has its roots in the Iranian religious tradition and that its relationship to Mazdaism, or Zoroastrianism, is more or less like that of Christianity to Judaism". Manichaeism's basic doctrine was that the world and all corporeal bodies were constructed from the substance of Satan, an idea that is fundamentally at odds with the Zoroastrian notion of a world that was created by God and that is all good, and any corruption of it is an effect of the bad. From what may be inferred from many Manichean texts and a few Zoroastrian sources, the adherents of the two religions (or at least their respective priesthoods) despised each other intensely. Many aspects of Zoroastrianism are present in the culture and mythologies of the peoples of the Greater Iran, not least because Zoroastrianism was a dominant influence on the people of the cultural continent for a thousand years. Even after the rise of Islam and the loss of direct influence, Zoroastrianism remained part of the cultural heritage of the Iranian language-speaking world, in part as festivals and customs, but also because Ferdowsi incorporated a number of the figures and stories from the Avesta in his epic Shāhnāme, which in turn is pivotal to Iranian identity. The Avesta is the religious book of Zoroastrians that contains a collection of sacred texts. The history of the Avesta is found in many Pahlavi texts. According to tradition, Ahura Mazda created the twenty-one nasks which Zoroaster brought to Vishtaspa. Here, two copies were created, one which was put in the house of archives, and the other put in the Imperial treasury. During Alexander's conquest of Persia, the Avesta was burned, and the scientific sections that the Greeks could use were dispersed among themselves. Under the reign of King Valax of the Arsacis Dynasty, an attempt was made to restore the Avesta. During the Sassanid Empire, Ardeshir ordered Tansar, his high priest, to finish the work that King Valax had started. Shapur I sent priests to locate the scientific text portions of the Avesta that were in the possession of the Greeks. Under Shapur II, Arderbad Mahrespandand revised the canon to ensure its orthodox character, while under Khosrow I, the Avesta was translated into Pahlavi. The compilation of these ancient texts was successfully established underneath the Mazdean priesthood and the Sassanian emperors. Only a fraction of the texts survive today. The later manuscripts all date from this millennium, the latest being from 1288, 590 years after the fall of the Sassanian Empire. The texts that remain today are the Gathas, Yasna, Visperad and the Vendidad. Along with these texts is the communal household prayer book called the Khordeh Avesta, which contains the Yashts and the Siroza. The rest of the materials from the Avesta are called "Avestan fragments". Middle Persian and Pahlavi works created in the 9th and 10th century contain many religious Zoroastrian books, as most of the writers and copyists were part of the Zoroastrian clergy. The most significant and important books of this era include the Denkard, Bundahishn, Menog-i Khrad, Selections of Zadspram, Jamasp Namag, Epistles of Manucher, Rivayats, Dadestan-i-Denig, and Arda Viraf Namag. All Middle Persian texts written on Zoroastrianism during this time period are considered secondary works on the religion, and not scripture. Nonetheless, these texts have a strong influence on the religion. Zoroastrianism was founded by Zoroaster (or Zarathustra), later deemed a prophet, in ancient Iran. The precise date of the founding of Zoroastrianism is uncertain. Zoroaster was born in either Northeast Iran or Southwest Afghanistan. He was born into a culture with a polytheistic religion, which included animal sacrifice and the ritual use of intoxicants, quite similar to early forms of Hinduism in India. Zoroaster's birth and early life are little documented. What is known is recorded in the Gathas—the core of the Avesta, which contains hymns thought to be composed by Zoroaster himself. Born into the Spitama clan, he worked as a priest. He had a wife, three sons, and three daughters. Zoroaster rejected the religion of the Bronze Age Iranians, with their many gods and oppressive class structure, in which the Karvis and Karapans (princes and priests) controlled the ordinary people. He also opposed animal sacrifices and the use of the hallucinogenic Haoma plant (possibly a species of ephedra) in rituals, but held the rooster as a "symbol of light" and associated it with "good against evil" because of his heraldic actions. According to Zoroastrian belief, when Zoroaster was 30 years old, he went into the Daiti river to draw water for a Haoma ceremony; when he emerged, he received a vision of Vohu Manah. After this, Vohu Manah took him to the other six Amesha Spentas, where he received the completion of his vision. This vision radically transformed his view of the world, and he tried to teach this view to others. Zoroaster believed in one creator God, teaching that only one God was worthy of worship. Some of the deities of the old religion, the Daevas (Devas in Sanskrit), appeared to delight in war and strife. Zoroaster said these were evil spirits, workers of Angra Mainyu. Zoroaster's ideas were not taken up quickly; he originally only had one convert: his cousin Maidhyoimanha. The local religious authorities opposed his ideas, considering that their faith, power, and particularly their rituals, were threatened by Zoroaster's teaching against over-ritualising religious ceremonies. Many did not like Zoroaster's downgrading of the Daevas to evil spirits. After 12 years of little success, Zoroaster left his home. In the country of King Vishtaspa in Bactria, the king and queen heard Zoroaster debating with the religious leaders of the land and decided to accept Zoroaster's ideas as the official religion of their kingdom. Zoroaster died in his late 70s. Very little is known of the time between Zoroaster and the Achaemenian period, except that Zoroastrianism spread to Western Iran. By the time of the founding of the Achaemenid Empire, Zoroastrianism was already a well-established religion. Humata, Hukhta, Huvarshta (Good Thoughts, Good Words, Good Deeds) are the basic tenets of the religion. In Zoroastrianism, Ahura Mazda is the beginning and the end, the creator of everything that can and cannot be seen, the Eternal, the Pure and the only Truth. In the Gathas, the most sacred texts of Zoroastrianism thought to have been composed by Zoroaster himself, the prophet acknowledged devotion to no other divinity besides Ahura Mazda. Daena (din in modern Persian) is the eternal Law, whose order was revealed to humanity through the Mathra-Spenta ("Holy Words"). Daena has been used to mean religion, faith, law, and even as a translation for the Hindu and Buddhist term Dharma, to which it is related. The latter is often interpreted as "duty" but can also mean social order, right conduct, or virtue. The metaphor of the "path" of Daena is represented in Zoroastrianism by the muslin undershirt Sudra, the "Good/Holy Path", and the 72-thread Kushti girdle, the "Pathfinder". Daena should not be confused with the fundamental principle asha (Vedic rta), the equitable law of the universe, which governed the life of the ancient Indo-Iranians. For these, asha was the course of everything observable—the motion of the planets and astral bodies; the progression of the seasons; and the pattern of daily nomadic herdsman life, governed by regular metronomic events such as sunrise and sunset. All physical creation (geti) was thus determined to run according to a master plan—inherent to Ahura Mazda—and violations of the order (druj) were violations against creation, and thus violations against Ahura Mazda. This concept of asha versus the druj should not be confused with the good-versus-evil battle evident in western religions, for although both forms of opposition express moral conflict, the asha versus druj concept is more systemic and less personal, representing, for instance, chaos (that opposes order); or "uncreation", evident as natural decay (that opposes creation); or more simply "the lie" (that opposes truth and righteousness). Moreover, in his role as the one uncreated creator of all, Ahura Mazda is not the creator of druj, which is "nothing", anti-creation, and thus (likewise) uncreated. Thus, in Zoroaster's revelation, Ahura Mazda was perceived to be the creator of only the good (Yasna 31.4), the "supreme benevolent providence" (Yasna 43.11), that will ultimately triumph (Yasna 48.1). In this schema of asha versus druj, mortal beings (both humans and animals) play a critical role, for they too are created. Here, in their lives, they are active participants in the conflict, and it is their duty to defend order, which would decay without counteraction. Throughout the Gathas, Zoroaster emphasizes deeds and actions, and accordingly asceticism is frowned upon in Zoroastrianism. In later Zoroastrianism, this was explained as fleeing from the experiences of life, which was the very purpose that the urvan (most commonly translated as the "soul") was sent into the mortal world to collect. The avoidance of any aspect of life, which includes the avoidance of the pleasures of life, is a shirking of the responsibility and duty to oneself, one's urvan, and one's family and social obligations. Central to Zoroastrianism is the emphasis on moral choice, to choose the responsibility and duty for which one is in the mortal world, or to give up this duty and so facilitate the work of druj. Similarly, predestination is rejected in Zoroastrian teaching. Humans bear responsibility for all situations they are in, and in the way they act toward one another. Reward, punishment, happiness, and grief all depend on how individuals live their lives. In Zoroastrianism, good transpires for those who do righteous deeds. Those who do evil have themselves to blame for their ruin. Zoroastrian morality is then to be summed up in the simple phrase, "good thoughts, good words, good deeds" (Humata, Hukhta, Hvarshta in Avestan), for it is through these that asha is maintained and druj is kept in check. Through accumulation, several other beliefs were introduced to the religion that, in some instances, supersede those expressed in the Gathas. In the late 19th century, the moral and immoral forces came to be represented by Spenta Mainyu and its antithesis Angra Mainyu, the "good spirit" and "evil spirit" emanations of Ahura Mazda, respectively. Although the names are old, this opposition is a modern Western-influenced development popularized by Martin Haug in the 1880s, and was, in effect, a realignment of the precepts of Zurvanism (Zurvanite Zoroastrianism), which had postulated a third deity, Zurvan, to explain a mention of twinship (Yasna 30.3) between the moral and immoral. Although Zurvanism had died out by the 10th century, the critical question of the "twin brothers" mentioned in Yasna 30.3 remained, and Haug's explanation provided a convenient defence against Christian missionaries, who disparaged the Parsis for their "dualism". Haug's concept was subsequently disseminated as a Parsi interpretation, thus corroborating Haug's theory, and the idea became so popular that it is now almost universally accepted as doctrine. Zoroastrianism developed the abstract concepts of heaven and hell, as well as personal and final judgment, all of which are only alluded to in the Gathas. Yasna 19, which has only survived in a Sassanid era ([–650 CE] Zend commentary on the Ahuna Vairya invocation), prescribes a Path to Judgment known as the Chinvat Peretum or Chinvat bridge (cf: As-Sirāt in Islam), which all souls had to cross, and judgment (over thoughts, words, and deeds performed during a lifetime) was passed as they were doing so. However, the Zoroastrian personal judgment is not final. At the end of time, when evil is finally defeated, all souls will be ultimately reunited with their Fravashi. Thus, Zoroastrianism can be said to be a universalist religion with respect to salvation. In addition, and strongly influenced by Akkadian and Babylonian practices, the Achaemenids popularized shrines and temples, hitherto alien forms of worship. In the wake of Achaemenid expansion, shrines were constructed throughout the empire and particularly influenced the role of Mithra, Aredvi Sura Anahita, Verethragna and Tishtrya, all of which, in addition to their original (proto-)Indo-Iranian functions, now also received Perso-Babylonian functions. According to the Zoroastrian creation myth, Ahura Mazda existed in light and goodness above, while Angra Mainyu existed in darkness and ignorance below. They have existed independently of each other for all time, and manifest contrary substances. Ahura Mazda first created seven abstract heavenly beings called Amesha Spentas, who support him and represent beneficent aspects, along with numerous yazads, lesser beings worthy of worship. He then created the universe itself in order to ensnare evil. Ahura Mazda created the floating, egg-shaped universe in two parts: first the spiritual (menog) and 3,000 years later, the physical (getig). Ahura Mazda then created Gayomard, the archetypical perfect man, and the first bull. While Ahura Mazda created the universe and humankind, Angra Mainyu, whose instinct is to destroy, miscreated demons, evil yazads, and noxious creatures (khrafstar) such as snakes, ants, and flies. Angra Mainyu created an opposite, evil being for each good being, except for humans, which he found he could not match. Angra Mainyu invaded the universe through the base of the sky, inflicting Gayomard and the bull with suffering and death. However, the evil forces were trapped in the universe and could not retreat. The dying primordial man and bull emitted seeds. From the bull's seed grew all beneficial plants and animals of the world, and from the man's seed grew a plant whose leaves became the first human couple. Humans thus struggle in a two-fold universe trapped with evil. The evils of this physical world are not products of an inherent weakness, but are the fault of Angra Mainyu's assault on creation. This assault turned the perfectly flat, peaceful, and ever day-lit world into a mountainous, violent place that is half night. Zoroastrianism also includes beliefs about the renovation of the world and individual judgment (cf. general and particular judgment), including the resurrection of the dead. Individual judgment at death is by the Bridge of Judgment, which each human must cross, facing a spiritual judgment. Humans' actions under their free will determine the outcome. One is either greeted at the bridge by a beautiful, sweet-smelling maiden or by an ugly, foul-smelling old woman. The maiden leads the dead safely across the bridge to the Amesha Spenta Good Mind, who carries the dead to paradise. The old woman leads the dead down a bridge that narrows until the departed falls off into the abyss of hell. Zoroastrian hell is reformative; punishments fit the crimes, and souls do not rest in eternal damnation. Hell contains foul smells and evil food, and souls are packed tightly together although they believe they are in total isolation. In Zoroastrian eschatology, a 3,000-year struggle between good and evil will be fought, punctuated by evil's final assault. During the final assault, the sun and moon will darken and humankind will lose its reverence for religion, family, and elders. The world will fall into winter, and Angra Mainyu's most fearsome miscreant, Azi Dahaka, will break free and terrorize the world. The final savior of the world, Saoshyant, will be born to a virgin impregnated by the seed of Zoroaster while bathing in a lake. Saoshyant will raise the dead—including those in both heaven and hell—for final judgment, returning the wicked to hell to be purged of bodily sin. Next, all will wade through a river of molten metal in which the righteous will not burn. Heavenly forces will ultimately triumph over evil, rendering it forever impotent. Saoshyant and Ahura Mazda will offer a bull as a final sacrifice for all time, and all humans will become immortal. Mountains will again flatten and valleys will rise; heaven will descend to the moon, and the earth will rise to meet them both. Humanity requires two judgments because there are as many aspects to our being: spiritual (menog) and physical (getig). The Zoroastrian Atash Behram of Yazd, Iran. Zoroastrian communities comprise two main groups of people: those of South Asian Zoroastrian background known as Parsis (or Parsees), and those of Central Asian background. According to a survey in 2004 by the Zoroastrian Associations of North America, the number of Zoroastrians worldwide was estimated at between 124,000 and 190,000. The number is imprecise because of wildly diverging counts in Iran. India's 2011 Census found 57,264 Parsi Zoroastrians. Small Zoroastrian communities may be found all over the world, with a continuing concentration in Western India, Central Iran, and Southern Pakistan. Zoroastrians of the diaspora are primarily located in Great Britain and the former British colonies, particularly Canada and Australia, as well as in the American state of California where they form part of the Iranian American community. India is considered to be home to the largest Zoroastrian population in the world. When the Islamic armies, under the first Caliphs, invaded Persia, those locals who were unwilling to convert to Islam sought refuge, first in the mountains of Northern Iran, then the regions of Yazd and its surrounding villages. Later, in the ninth century CE, a group sought refuge in the western coastal region of India, and also scattered to other regions of the world. Following the fall of the Sassanid Empire in 651 CE, many Zoroastrians migrated. Among them were several groups who ventured to Gujarat on the western shores of the Indian subcontinent, where they finally settled. The descendants of those refugees are today known as the Parsis. The year of arrival on the subcontinent cannot be precisely established, and Parsi legend and tradition assigns various dates to the event. In the Indian census of 2001, the Parsis numbered 69,601, representing about 0.006% of the total population of India, with a concentration in and around the city of Mumbai. Due to a low birth rate and high rate of emigration, demographic trends project that by 2020 the Parsis will number only about 23,000 or 0.002% of the total population of India. The Parsis would then cease to be called a community and will be labeled a "tribe". By 2008, the birth-to-death ratio was 1:5; 200 births per year to 1,000 deaths. In Pakistan, they number fewer than 1,700, mostly living in Karachi. Iran's figures of Zoroastrians have ranged widely; the last census (1974) before the revolution of 1979 revealed 21,400 Zoroastrians. Some 10,000 adherents remain in the Central Asian regions that were once considered the traditional stronghold of Zoroastrianism, i.e., Bactria (see also Balkh), which is in Northern Afghanistan; Sogdiana; Margiana; and other areas close to Zoroaster's homeland. In Iran, emigration, out-marriage and low birth rates are likewise leading to a decline in the Zoroastrian population. Zoroastrian groups in Iran say their number is approximately 60,000. According to the Iranian census data from 2011 the number of Zoroastrians in Iran was 25,271. Communities exist in Tehran, as well as in Yazd, Kerman and Kermanshah, where many still speak an Iranian language distinct from the usual Persian. They call their language Dari (not to be confused with the Dari of Afghanistan). Their language is also called Gavri or Behdini, literally "of the Good Religion". Sometimes their language is named for the cities in which it is spoken, such as Yazdi or Kermani. Iranian Zoroastrians were historically called Gabrs, originally without a pejorative connotation but in the present-day derogatorily applied to all non-Muslims. More recently the Zoroastrian faith has gained strength among the Kurds in Iraq and claims to have 100,000 followers. Zoroastrians currently seek official status for their religion in Iraqi Kurdistan. North America is thought to be home to 18,000–25,000 Zoroastrians of both South Asian and Iranian background. A further 3,500 live in Australia (mainly in Sydney). As of 2012, the population of Zoroastrians in USA was 15,000, making it the third largest Zoroastrian population in the World after those of India and Iran. ^ Less frequently known as Mazdaism or Magianism from the Magi or Zarathustraism from an alternate name of Zoroaster. ^ The change over the last decade is attributed[by whom?] to a greater level of reporting and open self-identification more so than to an actual increase in population; however, precise numbers remain difficult to obtain in part due to high levels of historic persecution in Middle Eastern regions. ^ As a kind of proto-Zoroastrianism, both worship "Seven Angels" alongside the primary deity and have a high regard for the concept of truth. ^ "Zarathustra – Iranian prophet". Retrieved 9 June 2017. ^ a b c Gerardo Eastburn (2015). The Esoteric Codex: Zoroastrianism. p. 1. ISBN 9781312935846. Retrieved 2017-06-14. ^ Beckwith, Christopher I. (2015). Greek Buddha: Pyrrho's Encounter with Early Buddhism in Central Asia. Princeton University Press. pp. 132–133. ISBN 9781400866328. ^ "Zoroastrians Keep the Faith, and Keep Dwindling". Laurie Goodstein. 6 September 2006. Retrieved 25 September 2017. ^ Deena Guzder (9 December 2008). "The Last of the Zoroastrians". Time. Retrieved 25 September 2017. ^ Fatah, Lara (2015-11-26). "The curious rebirth of Zoroastrianism in Iraqi Kurdistan". Projects21.org. Retrieved 27 February 2018. ^ "Zarathushtra's Philosophy: Basic Overview". Zarathushtra.com. Retrieved 2017-06-14. ^ Boyce 1979, pp. 6–12. ^ "M.N. Dhalla: History of Zoroastrianism (1938)". Avesta.org. Retrieved 2017-06-14. ^ "AṦA (Asha "Truth") – Encyclopaedia Iranica". Iranicaonline.org. Retrieved 2017-06-14. ^ "Ahura Mazdā – Encyclopaedia Iranica". Iranicaonline.org. Retrieved 2017-06-14. ^ "Druj– Encyclopaedia Iranica". Iranicaonline.org. Retrieved 2017-06-14. ^ "Zoroaster gave a wholly new dimension to his worship, however, by hailing him as the one uncreated God (Y. 30.3, 45.2), wholly wise, benevolent and good, Creator as well as upholder of aša (Y. 31.8)". Iranicaonline.org. Retrieved 2017-06-14. ^ "Since the Aməṧa Spəṇtas represent the totality of good moral qualities, it is easy to understand why, by analogy with the inherited opposition between *ṛtá- 'truth' and *drugh- 'lie,' the other Aməṧa Spəṇtas were similarly assigned their evil counterparts". Iranicaonline.org. Retrieved 2017-06-14. ^ "The better one of the two spirits told the evil one that they were by nature opposed to each other in their thoughts and teachings, understandings and beliefs, words, and deeds, selves and souls—in nothing could they twain ever meet". Avesta.org. Retrieved 2017-06-14. ^ "In the Gathas Angra Mainyu is the direct opposite of Spənta Mainyu". Iranicaonline.org. Retrieved 2017-06-14. ^ ""The daēvas are said (Y. 32.3) to be the offspring, not of Angra Mainyu, but of Akəm Manah ('evil thinking'). But in Y. 30.6 it is the 'deceiver,' dəbaaman, most probably Angra Mainyu, who induces them to choose acištəm manah ('The worst thinking')." The name Angra Mainyu appears only once (Y. 45.2), when the "more bounteous of the spirits twain" declares his absolute antithesis to the "evil" one in all things. "At the beginning of creation, the recital of the Ahuna Vairya prayer by Ahura Mazdā put Angra Mainyu to flight (Y. 19. 15). Angra Mainyu created Aži Dahāka (Y. 9.8); but he recoiled in fear from Mithra's mace (Yt. 10.97 and 134). He broke into Aša's creation (Yt. 13.77) but had to flee from the face of the earth (Yt. 17.19) when Zoroaster was born."". Iranicaonline.org. Retrieved 2017-06-14. ^ a b Goodstein, Laurie (2008-09-06). "Zoroastrians Keep the Faith, and Keep Dwindling". The New York Times. Retrieved 2009-10-03. ^ Browne, T. (1643) "Religio Medici"
^ Duchesne-Guillemin, Jacques. "Zoroastrianism". Encyclopedia Britannica. ^ Constance E. Plumptre (2011). General Sketch of the History of Pantheism. p. 81. ISBN 9781108028011. Retrieved 2017-06-14. ^ a b "Zoroastrianism: Holy text, beliefs and practices". Iranicaonline.org. 2010-03-01. Retrieved 2017-06-14. ^ Richard Foltz and Manya Saadi-nejad, "Is Zoroastrianism an Ecological Religion?" Archived 2016-01-01 at the Wayback Machine"
^ Boyce 2007, p. 205. ^ Khan, Roni K (1996). "Traditional Zoroastrianism: Tenets of the Religion". Tenets.parsizoroastrianism.com (Online ed.). Retrieved 2009-10-08. ^ a b c Patrick Karl O'Brien, ed. Atlas of World History, concise edn. (NY: Oxford UP, 2002), 45. ^ Boyce 1979, p. 150. ^ a b c d Boyce 1979, p. 146. ^ Boyce 1979, p. 158. ^ "Kamar Oniah Kamaruzzaman, Al-Biruni: Father of Comparative Religion". Lib.iium.edu.my. Archived from the original on 13 July 2015. Retrieved 9 June 2017. ^ Buillet 1978, p. 37,138. ^ a b c d Boyce 1979, pp. 147. ^ Buillet 1978, p. 59. ^ a b c Boyce 1979, p. 151. ^ Boyce 1979, p. 152. ^ Boyce 1979, p. 163. ^ a b c Boyce 1979, p. 157. ^ Boyce 1979, p. 175. ^ "CONVERSION vii. Zoroastrian faith in mod. per. – Encyclopaedia Iranica". Iranicaonline.org. Retrieved 2017-06-14. ^ "The Jury Is Still Out On Women as Parsi Priests". Parsi Khabar. 2011-03-09. Retrieved 2013-10-12. ^ "A group of 8 Zartoshti women received their Mobedyar Certificate from Anjoman Mobedan in Iran". Amordad6485.blogfa.com. Retrieved 2017-06-14. ^ "Sedreh Pooshi by Female Mobedyar in Toronto Canada". Parsinews.net. 2013-06-19. Retrieved 2017-06-14. ^ While estimates for the Achaemenid Empire range from 10–80+ million, most prefer 50 million. Prevas (2009, p. 14) estimates 10 million 1. Langer (2001, p. 40) estimates around 16 million 2. McEvedy and Jones (2001, p. 50) estimates 17 million 3 Archived 2013-10-13 at the Wayback Machine. Strauss (2004, p. 37) estimates about 20 million 4. Ward (2009, p. 16) estimates at 20 million 5. Aperghis (2007, p. 311) estimates 32 million 6. Scheidel (2009, p. 99) estimates 35 million 7. Zeinert (1996, p. 32) estimates 40 million 8. Rawlinson and Schauffler (1898, p. 270) estimates possibly 50 million 9. Astor (1899, p. 56) estimates almost 50 million 10. Lissner (1961, p. 111) estimates probably 50 million 11. Milns (1968, p. 51) estimates some 50 million 12. Hershlag (1980, p. 140) estimates nearly 50 million 13. Yarshater (1996, p. 47) estimates by 50 million 14. Daniel (2001, p. 41) estimates at 50 million 15. Meyer and Andreades (2004, p. 58) estimates to 50 million 16. Pollack (2004, p. 7) estimates about 50 million 17. Jones (2004, p. 8) estimates over 50 million 18. Safire (2007, p. 627) estimates in 50 million 19. Dougherty (2009, p. 6) estimates about 70 million 20. Richard (2008, p. 34) estimates nearly 70 million 21. Mitchell (2004, p. 16) estimates over 70 million 22. Hanson (2001, p. 32) estimates almost 75 million 23. West (1913, p. 85) estimates about 75 million 24. Zenos (1889, p. 2) estimates exactly 75 million 25. Cowley (1999 and 2001, p. 17) estimates possibly 80 million 26. Cook (1904, p. 277) estimates exactly 80 million 27. ^ "Zoroastrianism". jewishencyclopedia.com. 2012. Retrieved 23 February 2012. ^ Black & Rowley 1987, p. 607b. ^ Duchesne-Guillemin 1988, p. 815. ^ e.g., Boyce 1982, p. 202. ^ Š. Kulišić; P.Ž. Petrović; N. Pantelić. "Бели бог". Српски митолошки речник (in Serbian). Belgrade: Nolit. pp. 21–22. ^ Diószegi, Vilmos (1998) . A sámánhit emlékei a magyar népi műveltségben (in Hungarian) (1. reprint kiadás ed.). Budapest: Akadémiai Kiadó. ISBN 963-05-7542-6. The title means: “Remnants of shamanistic beliefs in Hungarian folklore”. ^ Gherardo Gnoli, “Manichaeism: An Overview”, in Encyclopedia of Religion, ed. Mircea Eliade (NY: MacMillan Library Reference USA, 1987), 9: 165. ^ Zaehner 1956, pp. 53–54. ^ Bromiley 1995, p. 124. ^ "Effect of Wearing Cap on Zarathustri Urvaan: by Ervad (Dr.) Hoshang J. Bhadha". Tenets.zoroastrianism.com. Archived from the original on 2017-07-27. Retrieved 2017-06-14. 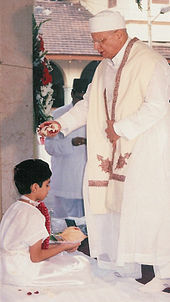 ^ "The Parsi Community in Karachi, Pakistan". Public Radio International. ^ K. E. Eduljee (2008-06-28). "Zoroastrian Demographics & Group Names". Heritageinstitute.com. Retrieved 2017-06-14. ^ U.S. State Department (2009-10-26). "Iran – International Religious Freedom Report 2009". The Office of Electronic Information, Bureau of Public Affair. Retrieved 2009-12-01. ^ "Census: Iran young, urbanised and educated". Egypt Independent. 2012-07-29. Retrieved 2017-06-14. ^ "Zoroastrian faith returns to Kurdistan in response to ISIS violence". Rudaw. 2015-06-02. Retrieved 2016-05-17. ^ "Zoroastrianism in Iraq seeks official recognition". Al-Monitor. 2016-02-17. Retrieved 2016-05-17. ^ NIAC inSight, Washington insights for the Iranian-American community from the National Iranian American Council. "An Old Faith in the New World – Zoroastrianism in the United States". www.niacinsight.com. Kellens, Jean, "Avesta", Encyclopaedia Iranica, 3, New York: Routledge and Kegan Paul pp. 35–44.